Santiago’s father wanted him to become a priest, but he respected his son’s dream and gave him gold to buy his flock of sheep, so that Santiago could travel as a shepherd. The alchemist and Santiago part ways near the end of Santiago’s quest, at a monastery in the desert where they are welcomed by a generous monk. The alchemist turns metal into gold in the monk’s kitchen, and gives the monk a portion for his generosity to pilgrims. Early in the novel, Santiago is contemplating his annual return to a town where he sells some of his sheep. The previous year he sold his sheep to a merchant there, and grew infatuated with the merchant’s daughter while waiting to deal with the man. The goddess of the forest appears in the brief prologue to the novel, in the context of a story read by the alchemist. In the story, the goddess questions the lake about her weeping, and assumes she weeps for the dead Narcissus. Champlin, Nikola. "The Alchemist Characters." LitCharts. LitCharts LLC, 21 Mar 2016. Web. 19 Apr 2019. Champlin, Nikola. "The Alchemist Characters." LitCharts LLC, March 21, 2016. 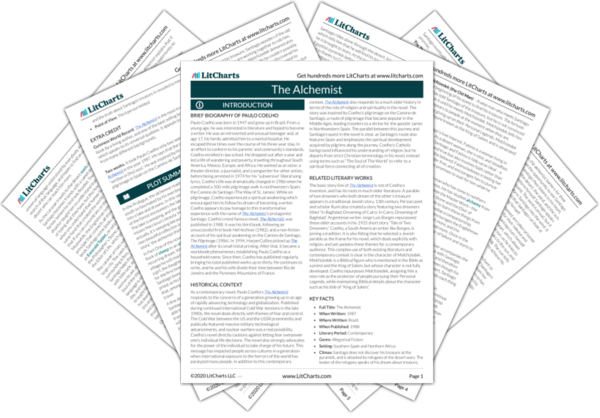 Retrieved April 19, 2019. https://www.litcharts.com/lit/the-alchemist/characters.